Separate egg yolks from whites in a medium bowl. Mash the egg yolks, mayonnaise, relish, mustard, garlic and salt. Scoop even amounts of filling into each egg half. 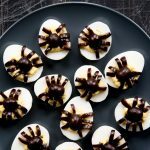 For a cleaner look, use a piping bag to pipe dollops of filling into each egg. Cut black olives in half for the spider body. Place on egg yolk mixture. Slice half olives longwise for 4 legs and arrange around olive halves to form a spider. Make sure you pick the whole canned black olives, not the pre-sliced ones. The pre-sliced ones are too thick and of course won’t work for the spider body.